Home » Almighty God , Eastern Lightning , God's work , the church of Almighty God , the last days , word » Almighty God's Word "The Truly Obedient Shall Surely Be Gained by God"
Almighty God's Word "The Truly Obedient Shall Surely Be Gained by God"
Almighty God says, "Obedience to God and submission to the work of God are one and the same. 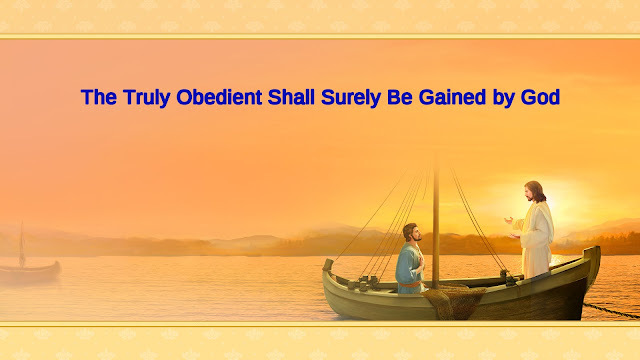 Those who submit only to God but not to the work of God cannot be deemed to be obedient, and surely much less can those who do not truly submit and are outwardly sycophantic. Those who truly submit to God are all able to gain from the work and achieve understanding of the disposition and work of God. Only such men truly submit to God. Such men are able to gain new knowledge from new work and experience new changes from the same. Only such men have the approval of God; only this kind of man is one perfected and has undergone a transformation of his disposition. Those approved by God are those who gladly submit to God, as well as to His word and work. Only this kind of man is in the right; only this kind of man truly desires and seeks God."